FAIRDEALING – Members of three fire departments spent several hours battling a large barn fire over the weekend. Fairdealing-Olive firefighter Jason Acord reports responders were called out Saturday after a homeowner saw flames coming from his barn after having been inside just a short time before. 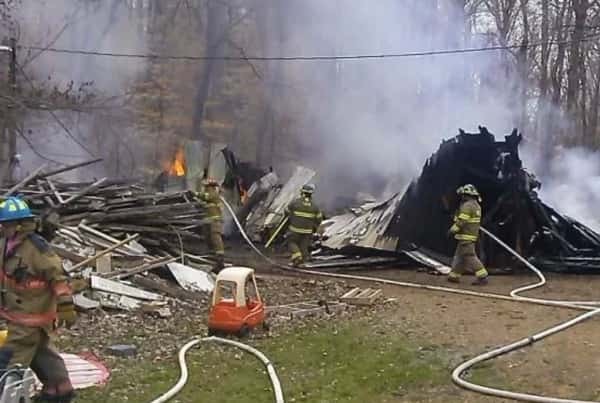 Firefighters from the Fairdealing-Olive, Hardin and Benton Fire Departments responded to the scene on Abraham Road where they discovered the structure fire was fully involved with the metal roof collapsing. Acord said more than a dozen firefighters turned out with five trucks to battle the blaze where a lack of water supply was of greatest concern with the nearest hydrant located a half-mile away. Acord reports Benton FD responded to help shuttle water to the scene including Benton Fire Chief Harry Green. “What would have normally taken us three or four hours took us four or five,” Acord reports. Additionally, power running to the building created hazards and delayed firefighting efforts. It is believed the fire was likely ignited by a wood-burning stove.